Spring is one of the busiest times of the year. There are more charity events and parties to plan in spring than any other season. However, the weather is getting warmer and it just makes you want to be outside. Holidays in spring include St. Patricks Day, Easter, Mother’s Day, and Memorial Day. Spring is also the time for elementary, high school, and college graduations, first communions, proms, and more. All that is in addition to the birthdays, church picnics, block parties, and other special events going on in the spring. 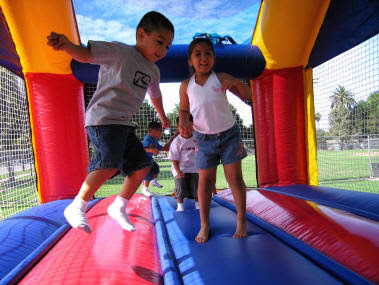 So there is no better time to add a fun, exciting bounce house rental to your next party plans. Not surprisingly, spring is the busiest time of the year for bounce house rentals. The good weather combined with the numerous social events adds up to more bounce house rentals on the weekends — and even during the week — that at any other time of the year.